A couple of nights ago, I put on a workshop up at Sociables, a fundraiser for the Father Mercredi Music Department. Brent Lawson and his students are raising money to go on a band trip to New Orleans. I thought it would be appropriate to do a jazz-themed portrait. 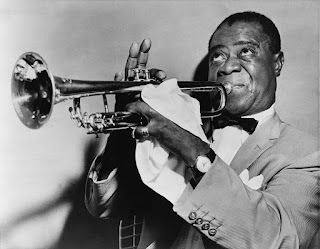 Can you think of anyone more appropriate when you put "jazz" and "New Orleans" together than Louis Armstrong? A small group of 12 painters set up at tables on the perimeter of the Sociables dance floor and dived right in. By the end of the evening, every single portrait was completely unique and interesting. One of the fundamentals of my workshops has always been that I paint along with the participants. The only difference between my painting and theirs is the size of the canvas. I usually go a little larger, so they can see better from a distance. At some point nearing the two-hour mark, I knew that I wouldn't be able to finish. (As the lights in Sociables were designed to create an energetic nightclub vibe, I waited until I got back to the studio to snap a pic) The first couple of layers of paint were on the canvas, including some of the details of the eyes, mouth and nose. However, I had yet to find my groove - the magic was missing. 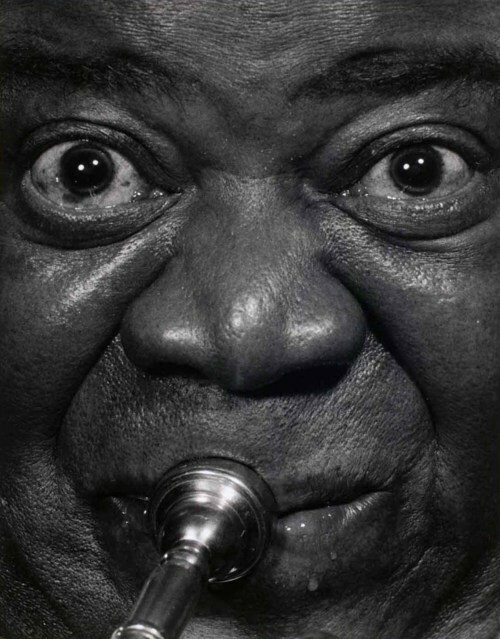 I needed a few hours in the studio to bring this portrait of Satchmo to its proper conclusion. Dylan (my older son) came along with me to this workshop. He was a huge help with the set-up and tear-down. Having recently painted his own portrait using my process, he was able to help a few of the painters who might have had a few too many wobbly pops and managed to miss a few key instructions. Dylan exhibited the patience of Job and gently took care of the folks who needed additional guidance. We packed up the car, drove home, got everything in the studio, and called it a night. It had turned out to be a rather long day and I was ready for bed. I don't know if it was in my deep deep sleep or in what I think of as my "waking sleep" that precedes it, but I watched myself painting up and down brush strokes on the portrait of Louis. The entire portrait was becoming this collection of small vertical lines, in all kinds of colours. I got up yesterday morning and began applying this technique on the right side of the canvas. It was like opening up a door and inside was the personality and artistic brilliance of the man who was ostensibly the greatest jazz artist of the previous century. I continued on the right side, then added some wild colours to balance out the piece and make Pops pop! This 18" x 24" original acrylic portrait of Louis Armstrong will be sold in an upcoming online auction. All sale proceeds will be donated to the Father Mercredi Music Department to support band students in their grand learning adventure to the "Big Easy", New Orlean, Louisiana. Stay tuned for details.